A peptic ulcer is a break in the lining of the gastointestinal tract, extending through to the muscular layer (muscularis mucosae) of the bowel wall. 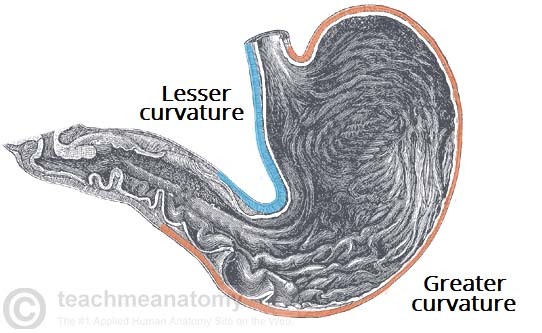 Whilst they may technically appear anywhere in the gastrointestinal tract, they are most often located on the lesser curvature of the proximal stomach or the first part of the duodenum. The incidence of peptic ulcers is estimated to be around 0.1-0.2% of the population per annum, with duodenal ulcers typically presenting earlier than gastric ulcers by around 20 years. In this article, we shall look at the clinical features, investigations and management of peptic ulcer disease. The normal gastrointestinal mucosa is protected by numerous defensive mechanisms, such as surface mucous secretion and HCO3- ion release. Ulceration occurs when there is an overwhelming presence of a noxious substance or when these natural barriers are impaired. Most commonly, this is through the presence of Helicobacter pylori (H. pylori) or Non-Steroidal Anti-Inflammatory Drug* (NSAID) use, however less common causes include high alcohol intake, steroid use, foreign body ingestion e.g batteries, or Zollinger-Ellison syndrome (rare). *NSAIDs can cause peptic ulcer formation by their action in inhibiting prostaglandin synthesis. This results in a reduced secretion of glycoprotein, mucous, and phospholipids by the gastric epithelial cells, which would otherwise normally contribute to the barrier protecting the gastric mucosa. The two main risk factors for peptic ulcers are H. pylori infection and prolonged NSAID use. Other risk factors include alcohol excess, smoking, chemotherapy or radiotherapy, and steroid use. Up to 70% of peptic ulcers are asymptomatic, however the main symptoms symptomatic patients typically present with are discussed below. Less commonly, patients may present with complications of their peptic ulcer disease, such as bleeding, perforation, or gastric outlet obstruction. The ALARMS mnemonic (Anaemia / Lost weight / Anorexia / Recent rapid onset / Melaena / Swallowing difficulties) has historically been used as a basis for referral for urgent endoscopy to assess for any malignancy. Any condition that causes dyspepsia, chest pain, or epigastric pain can be considered a differential for peptic ulcer disease. However, those most important to rule out include gastric malignancy, pancreatitis, acute coronary syndrome, gastro-oesphageal reflux, and gallstone disease. Zollinger-Ellison Syndrome refers to a triad of (i) severe peptic ulcer disease (ii) gastric acid hypersecretion and (iii) gastrinoma. The characteristic finding is a fasting gastrin level of >1000 pg/ml. A third of these cases are discovered as part of Multiple Endocrine Neoplasia Type 1 syndrome (Pancreas / Pituitary / Parathyroid tumours), so further investigations for MEN syndrome are often warranted. Patients with any red-flag symptoms should be referred for upper GI endoscopy (OGD). An OGD that identifies peptic ulceration (Fig. 2) will also allow for biopsies to be taken, which will be sent for histology and rapid urease “CLO” test (histological test used for determining presence of H. pylori). A full blood count may be warranted to assess for anaemia present. 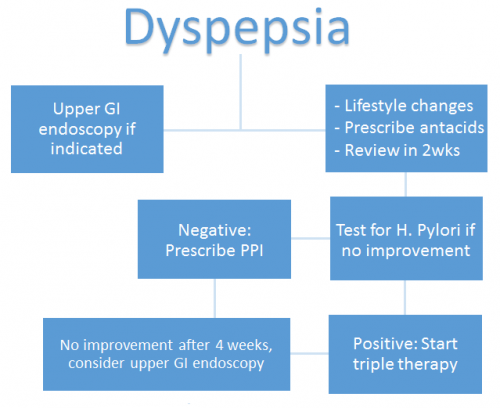 Any patient with dyspepsia should be given lifestyle advice to reduce symptoms, such as smoking cessation, weight loss, and reduction in alcohol consumption. There should also be an avoidance/cessation of NSAIDs where possible. Any patient who fails initial conservative management and has a negative H. pylori testing can be started on a Proton Pump Inhibitor (such as omeprazole or lansoprazole) for 8 weeks to reduce acid production. Those patients with a positive H. pylori test should be started on triple therapy*. NICE guidance recommends gastric ulcers to be biopsied at presentation due to malignant potential and a repeat endoscopy performed towards the end of PPI therapy to check for resolution. Persistence of symptoms post-PPI therapy should lead the clinician to suspect failure of H. pylori eradication, malignancy, or rare causes such as Zollinger-Ellison Syndrome. *Any patient with positive H. pylori testing requires eradication therapy (also termed triple therapy), which commonly consists of a PPI with oral amoxicllin and clarithromycin or metronidazole for 7 days. The main complications of peptic ulcer disease are perforation, haemorrhage, and pyloric stenosis (rare). By what mechanism are NSAIDs responsible for causing gastric ulceration? Which of the following best describes H. Pylori? Zollinger-Ellison syndrome is most commonly associated with which condition? Which of the following tests is not used to diagnose H. Pylori? Which blood vessel is most likely involved in cases of a posterior duodenal ulcer causing upper GI bleeding?